The world’s premier Revisionist scholar, Carlo Mattogno, focuses his microscope on Chelmno, the infamous German-run “death camp” located in Poland. It was here that huge masses of Jewish prisoners were rounded up and mercilessly gassed in so-called "gas vans" or shot (claims vary from 10,000 to1.3 million victims). Or so say the court historians, most of whom have never set foot near the remains of the camp. Mattogno, however, has examined reams of wartime documents and conducted on-site investigations at the Chelmno camp and around the neighboring countryside. 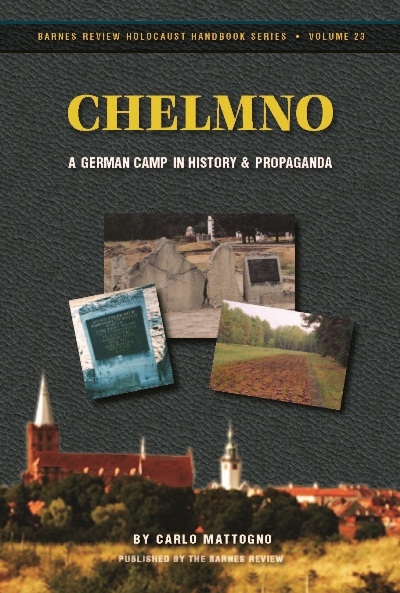 The resulting book challenges the conventional wisdom of what went on inside Chelmno. Mattogno covers the subject from every angle, undermining the orthodox claims about the camp with an overwhelmingly effective body of evidence. Eyewitness statements, gas wagons as extermination weapons, forensics reports, coroners’ reports, archeological excavations, the crematoria, building plans, official U.S. reports, German documents, evacuation efforts—all come under Mattogno’s scrutiny. Here are the uncensored facts about Chelmno, not the propaganda. This is a complementary volume to Santiago Alvarez's book on The Gas Vans. Both books were edited in parallel to make sure they are consistent with each other and are not repetitive.